This is my first entry for a challenge on Retro Rubber Challenge blog and I am so happy I was introduced here today. Having to use stamps that are at least a year old is pretty easy for someone who only buys twice a year and tends to go with the older sets. On with my card. The background paper, pumpkin sticker, tree, bats and bird stamps are all from Oriental Trading Co Halloween collections with manufactured dates of 4/13. The skeleton is also an older stamp purchased 8/14 in a craigslist buy. 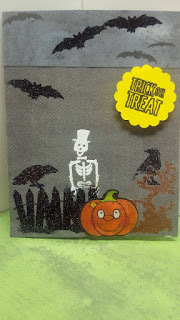 I had fun and heat embossed the skeleton with Whispers White, the tree with Whispers Copper, fence, birds and bats with Whispers Black. I hope you enjoy my project. Love all the detail and elements! That skeleton is the coolest! You put so much work into this design, I love it! Thanks so much for doing our challenge! Thank you Christine, I had a lot of fun with this one. What a fun Halloween card! I have to agree with Christine about the very cool skeleton. However, my fav is the pumpkin.... he is smiling! Thanks for joining us at Retro Rubber. Hope to see you in the gallery often! Thank you Katy, I really am not a halloween person (can't even watch commercials of horror films) but this was fun, and yes the smile made me happy. Thank you so much Claire, for sure I will stick around, a great portion of my stamps are older (craigslist buys) and I just started stamping last year I like to have a fun place to use them. Cute card! Lots of details to keep the recipient looking for awhile and keeping on display till the Christmas stuff comes out! LOL I am so impressed that you just started stamping and you are blogging already! That's fantastic!! Looking forward to seeing you in the Gallery! So much fun to play with our stamping stuff and you did a great job with this card. Welcome to the blogging world! Thanks for joining us over at Retro Rubber and come play again soon! Hello LeeAnn: So glad you found Retro Rubber challenge, I love playing with my old, beloved stamp sets, it's awesome to give them a chance to shine again. Your card is simply beautiful, love that white embossed skeleton, it looks fabulous in that spooky little scene you created.